For two years a considerable amount of time and energy and money has been spent on the Mueller investigation which have created talking points in many a conversation. We learn in Wikipedia: “The Special Counsel investigation of 2017 to 2019 (also referred to as the Mueller probe or the Mueller investigation) was a United States law enforcement and counterintelligence investigation of the Russian government’s efforts to interfere in the 2016 presidential election. According to its authorizing document which was signed by Deputy Attorney General Rod Rosenstein on May 17, 2017, the investigation’s scope included the allegation that there were links or coordination between Donald Trump’s presidential campaign and the Russian government as well as “any matters that arose or may arise directly from the investigation”. The scope of the investigation also included potential obstruction of justice by Trump and others. It was conducted by the Department of Justice Special Counsel’s Office, headed by Robert Mueller, a Republican and former Director of the Federal Bureau of Investigation (FBI)”. The report has just been released and its contents known. With the report now in, while some misdemeanors where unearthed on the part of Trump associates, Trump and his team were effectively exonerated from involvement in Russian collusion, although some detractors would argue that possibly may still exist. Even so, many an ardent Trump reporter would concur that it is likely the Russians did try to influence the Presidential elections, but then no more than President Obama did when he warned Britain they would go to the back of the queue in future USA UK trade deals if they were to leave the EU . Check out the “Mueller report: White House roasts critics over Mueller” and “Trump declares victory now but legal perils far from over” for further details. Given this investigation was likely part of a plan by his enemies to get Trump and preventing him from carrying out his agenda, including draining the swamp, it seems efforts to do so will continue, notwithstanding. Also of interest are other crimes e.g. Benghazi, Uranium 1, attempts to derail the Trump campaign, illegal spying on Trump and his associates, mysterious deaths and a whole raft of Deep State operations, which while spoken off e.g. by conspiracy theorists have not been fully pursued. It is outrageous that so much effort has been spent on the Mueller investigation, and people have been unduly hounded on relatively minor matters because of their links to Trump when these worse crimes have been largely ignored. In typical combative style, Trump posted shortly after: “WITCH HUNT INVESTIGATION CONCLUDED: NO COLLUSION OR OBSTRUCTION … After more than 2 YEARS, and $25 MILLION taxpayer dollars spent, the Mueller Report proves what I have been saying since Day One: NO COLLUSION, NO OBSTRUCTION — COMPLETE EXONERATION. Democrats worked with the Fake News Media for 2 years orchestrating this Nasty Witch Hunt to use our government as a weapon to take away the votes of 63 MILLION Americans. After they lied to the American people, Nancy Pelosi, Democratic leadership, and all of the 2020 Democratic candidates raised MILLIONS of dollars off of their phony Witch Hunt! Democrats and the Fake News media have proven that there is no line they won’t cross, so we need to fight back BIGGER AND BETTER THAN EVER BEFORE”. Clearly, there is little love lost between POTUS and his detractors. Making something of the events of the last two years is a challenge. We are not flies on the wall, but the following may fit the facts: “The “DECLAS” of FISA documents will expose the CRIMES of Obama and his agencies and MANY OTHER things involving OTHER governments of OTHER COUNTRIES!!!!! NONE of this could be brought out until AFTER the Mueller “investigation” was OVER and DONE with!!! This investigation started because of a FAKE, manufactured “Dossier” implicating that Donald J Trump had been “COLLUDING” with the “Russians”. It has been PROVEN that this “Dossier” was bought and PAID for by the Hillary Clinton campaign and the Democratic National Committee AND they KNEW that it was made up, manufactured, and fabricated out of thin air!!! That “Dossier” was the presented “evidence” used to obtain the FISA warrants which allowed them to illegally surveil the DJT campaign. Because the “evidence” was based on a FAKE document, the WHOLE THING is illegal. THAT is what began this entire “Mueller Investigation”. It was all about ACCUSATIONS against President Trump!!! This is why President Trump has repeatedly tweeted that this is a WITCH HUNT!!! Now that he is completely CLEARED of ALL “manufactured” accusations, the BLOCKADE has been removed. *The real “BLOCKADE” was Rod Rosenstein…follow me for a bit to see how this all fits together… *Robert Mueller, as head of this investigation, was under the authority of the Attorney General. *At the beginning of this investigation, that “AG” was Jeff Sessions, who “recused” himself from his position “over” this investigation because of his involvement in President Trump’s election so that there would be NO possible appearance of cover up what so ever. *That placed the investigation under the authority of the “Deputy Attorney General”, Rod Rosenstein. *Rod Rosenstein was an Obama “hold-over” in the DOJ and PART of the “Obama DeepState Coup” to remove DJT!!! 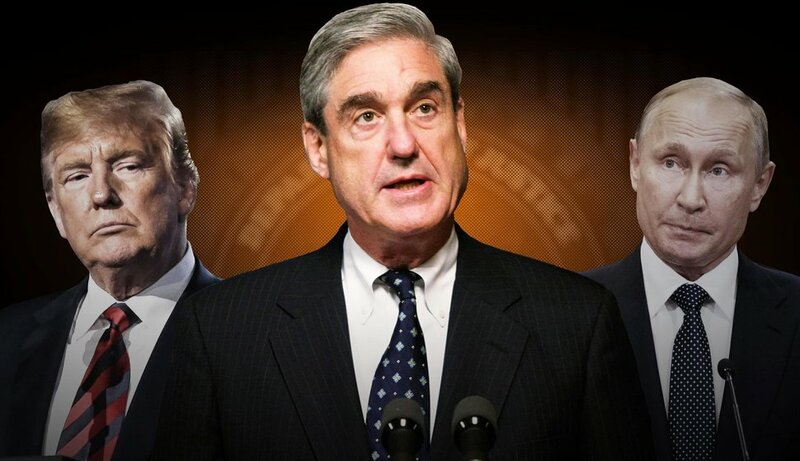 *Mueller was also the former Director and HEAD of the FBI from 2001-2013 under DeepSTATE Bush and Obama admin’s followed by James Comey from 2013-2017 when President Trump rightly FIRED him. *When a “Special Council Investigation” is conducted, it is completely brought under the control of the AG to over see and even call for the completion of it at that AG’s discretion. Because this investigation was NOT bringing the result they hoped for, Rod Rosenstein was NOT asking Mueller to END it and turn it in. They have been STALLING this for as long as they could!!!!!!! *Until Rod Rosenstein was GONE and a new “AG” was in place, the Mueller investigation was NOT going to end because they could NOT find the PROOF they needed to confirm the purpose of the investigation. *As long as this endless investigation was going on, it gave the DARK shadow over the President that the LEFT needed and hoped would LAST until the 2020 election. *They knew if POTUS fired Rod Rosenstein, it would appear that he was guilty of the accused wrong doings. “Collusion” is not an actual indictable crime, it was just a serious enough violation to bring impeachment. *The entire purpose of this “investigation” was to REMOVE Donald J Trump as President, PERIOD!!! *If they were unsuccessful with using this investigation to “impeach 45”, they could leave it OPEN and ongoing, and still use it to keep his IMPLIED GUILT for as long as they needed to, to help them WIN the 2020 election. *That is why this has taken SO LONG to END IT!!! The END of this “Special Council Investigation” is now the BEGINNING of the END of the DeepSTATE and the BEGINNING of the END of the Global EVIL Cabal that has had control of this planet for far too long! Stay tuned for the REST of this STORY”. Time will tell how significant the closing of this investigation that has caused so much angst and acrimony will be, but I have little doubt there will be significant events following on from this.